TPC Overall Rank: #77 out of 2933 rides. In User Top 10: 48 times. User Tracker Count: 140 times. This is one of the highlights of Knoebels along with Phoenix, Flyer, and Haunted Mansion. When I rode it, it was the biggest coaster I ever rode. I was as scary as hell when I got on. My friend, who was with me, said hed give me a dollar if I rode it. I took the bait, but was still scared. But when I got off the ride, I rode it six more times. Most elements on this ride are exciting, other than the final brake run. The first two drops were fabulous, and the double helix vibrated my feet, but it was exciting. The tunnel wasnt much, but the airtime hills and turns make some people begging for more, or mercy. This ride is like a banana split. The first drop was the ice cream, the second drop was chocolate sauce, the secondary turns and hills were like whipped cream, but the best part of this banana split was its helix. Mmmm....bananers. Anyway, this ride was great fun. The guy who made this hasnt made any other coasters. The seats are comfy. Ride this while at Knoebels, and dont miss Phoenix. 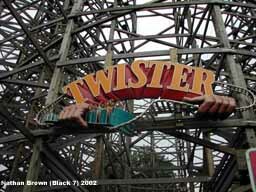 Twister is an excellent wooden roller coaster, though not nearly as good as the Phoenix. Located at the far left side of the park, Twister is in its own section at Knoebels. 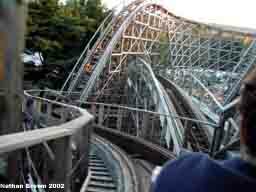 With a massive, light brown, wooden structure, Twister is designed to have an almost identical layout to the legendary Mr. Twister. Unlike the Phoenix, Twister isnt loaded in air-time and is instead filled with many twists and turns. Generally Twister has a wait under 10 minutes because of exceptionally fast loading, unloading, and dispatching. Along the walk up the queue line, you can see a bolt from the original Mr. Twister ride. My favorite seat was the second seat because it generally doesnt have a wait and its just as good as the front seat. Running a maroon and light green train, it depends on how busy Knoebels is if theyll run 1 or 2 trains. With no seatbelts, you are restrained only by an orange lap bar. Beginning the ride is a lift hill, followed by a curved drop and curve before a second lift hill. At the top, you wind around for a while and then plunge down a steep drop heading right into the beautiful structure. The back seat gets a pop of air-time during the drop. Following that is a large turnaround hill providing a viscious pop of air-time launching riders at the front of the train into the lap bar. It was the most exciting burst of air-time I have ever had on a roller coaster. Then you go down another large drop giving back seat riders some air-time. Afterwards you go through the mammoth double helix that is fast and exciting. There was some brief jostling. Later in the ride, you speed down a steep drop and around a curve and zoom through a suprise tunnel that caught me off-guard. Following the tunnel is a quick pop of air-time for front seat riders and a turn before hitting the brake run ending the long and fast-paced ride. Twister was fairly smooth for a twisting wooden coaster. Overall, an excellent twisting wooden coaster complimenting the Phoenix nicely. 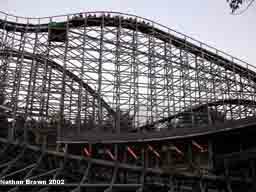 I highly recommend Twister for anyone who enjoys twister-layout wooden coasters. Pretty darn good wooden coaster. Twister, spawned from the famed Mr Twister (a ride which is one of those defunct coasters that I wish I could have experienced), was very fun. I liked the crimson train we rode in, and the, well, interesting double lift. I always wondered how that went together, and liked the transition between the two. Once at the top we dropped a bit and turned and off we went into the massive timber structure. To me, the best part is the double slanted helix element, reminiscent of one of my all-time favorite rides. This one also provided some fantastic laterals. The ride didnt really let up much, it maintained its pacing well (a big thing in my book) but wasnt superb in that same book. I almost want to go with a nine, but its just not there for me. Solid ride, a great tandem to Phoenix, but we know who wears the pants in the Knoebles wood collection. The very first time I went on this coaster last year, I initially liked it better than the Phoenix. With more rides on both, Ive reassessed that. Very nice ride with some beautiful banked curves. IMHO, one of the most attractive wooden coasters out there. Its hard to describe this ride accurately. Its very smooth for a woodie. It has 2 lift hills, 2 helixes, and tunnel and it twists around 32 times. It doesnt give you as much airtime as Phoenix but it definately is a very good addition to a small park. It runs faster at night and is more scary. Its a must ride for an enthusiast. 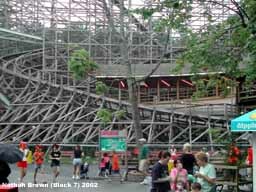 The Twister is a wood twister roller coaster.It was built by Knoebels/Leonard Adams. It was designed by John Fetterman. It was built in 1999. It is 101' tall, it is 3,900' long. It is fast, fun, rerideable, it has a large capacity, and a long duration. It resembles the original Mr Twister elements from Elitch Gardens, Colorado. This is an absolutely amazing coaster. It is not quite as good as its neighbor Pheonix, but very very good. I would have to say that it is more fun than intense, and it truely was a surprise. I had heard a whole lot about Pheonix, but this one is something that needs to be mentioned more often too. When you look at Knoebels website it says "Home of two world-class coasters", that is nothing but the truth. This is also a great ride to look at. Its stucture and twisted wood design is absolutely flawless and beautiful. The drop is great and the twists and turns are pure bliss. There is not a rough spot on the ride and is very smooth, which was also a surprise to me. I like rough wooden coasters, but the occasional smooth one with this kind of pacing is good with me. This is one of those rides that you just do not want to end. Great addition to Knoebels & a great accompanient coaster for Phoenix. Really carries a wide array of riders. Fast, long, and w/many crossovers w/32. 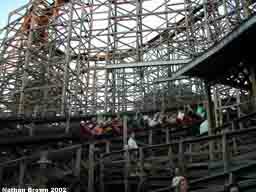 Kinda fizzles out at da end, but ride probably one of da most famous wooden coasters in da world. When I rode Twister around 4 oclock, I came off the ride a little disappointed; my memory of the ride from prior years was better. It could also have been the fact I had been riding the always superb air-fest, The Phoenix. Then I went back for night rides, and my faith in Twister was restored. It is so dark, that even if you know the layout, the drops and direction changes are really exciting, especially in the rear of the train. A unique and fun lift hill, two big, big drops, the helix, fast turns and the dash through the tunnel that is pulled off with great effect. The polar opposite ride to the Phoenix; you get the best of both worlds with these two coasters (+ Gs vs. - Gs.) Twister earns a high 9; no - the night rides pull a 10. This is a great coaster! Comparing "The Texas Giant" to the Twister--The Twister comes in best coaster! It is awsome with the rapid drops and turns, add to that the double helix! Wow!